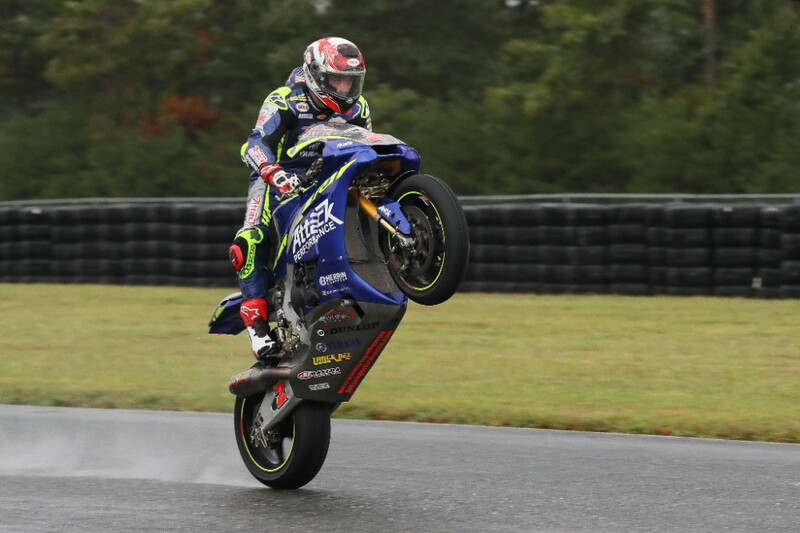 Herrin mastered the conditions today in a very wet Championship of New Jersey at New Jersey Motorsports Park, the Georgian backing up his victory from a few weeks ago in Pittsburgh with a textbook display of wet-weather riding that earned him a second Motul Superbike victory on the season. The win was the sixth of his AMA Superbike career and his first in the rain. In typical Herrin fashion, he started quickly but was surprised after the first lap to have the lead that he did. Herrin beat Yamalube/Westby Racing’s Mathew Scholtz by 37.1 seconds with the South African backing off the pace at the end of the race when he saw the gap he had on Monster Energy/Yamalube/Yamaha Factory Racing’s Cameron Beaubier. Beaubier was some 18 seconds adrift of Scholtz and in championship-winning mode, which meant he wasn’t taking any chances. Especially after having a big highside crash in the wet Superpole session. With Yoshimura Suzuki’s Toni Elias crashing out of third place, Beaubier has his hands on the title with a 72-point lead and only 75 points left on the table. He will likely earn his third MotoAmerica Superbike Championship in tomorrow’s second Motul Superbike race at NJMP. Yoshimura Suzuki’s Roger Hayden passed Genuine Broaster Chicken Honda’s Cameron Petersen on the final lap for fourth. It was Petersen’s best finish of the year in fifth, just .116 of a second behind the Suzuki. Such was Herrin’s performance that Petersen was the last rider on the lead lap. Cambr/KWR’s Kyle Wyman finished sixth, well clear of Monster Energy/Yamalube/Yamaha Factory Racing’s Garrett Gerloff. M4 ECSTAR Suzuki’s Jake Lewis crashed, remounted and finished eight with Thrashed Bike Racing’s Max Flinders ninth. Scheibe Racing BMW’s Danny Eslick was 10th. 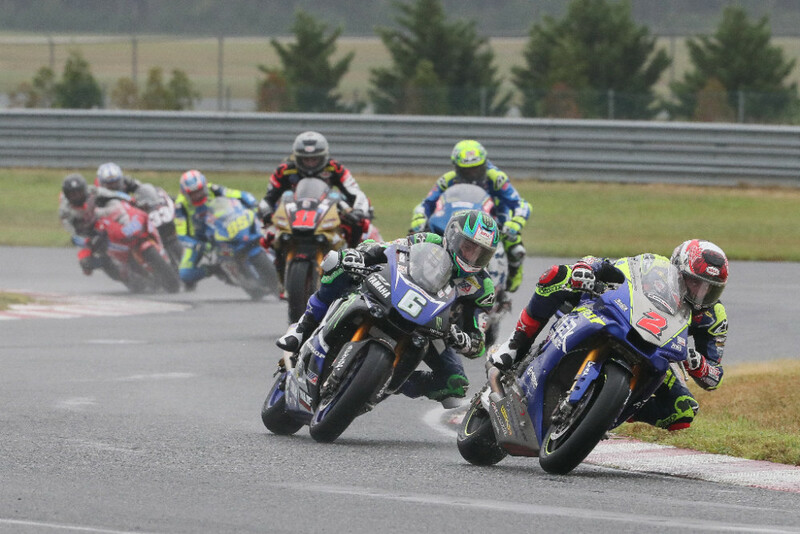 Beaubier now leads Elias by 72 points, 345-273, after his 15th podium finish of the season. Herrin is third, 20 points behind Elias. Scholtz is fourth, 43 points behind Herrin and 24 points ahead of fifth-placed Gerloff. 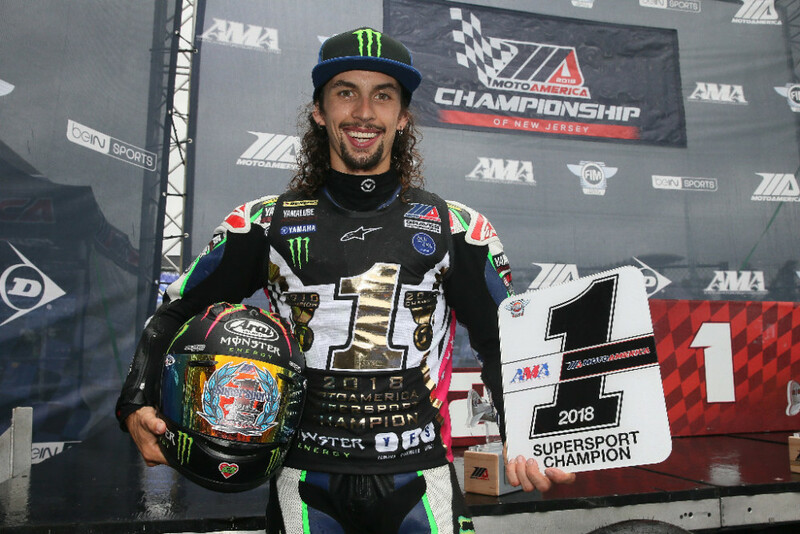 In Saturday’s Supersport race, Monster Energy/Yamaha Extended Service/Graves/Yamaha’s JD Beach clinched the 2018 Championship with his second-place finish and 12th podium in 13 races. For the Kentuckian, it was the second MotoAmerica Supersport Championship of his career. 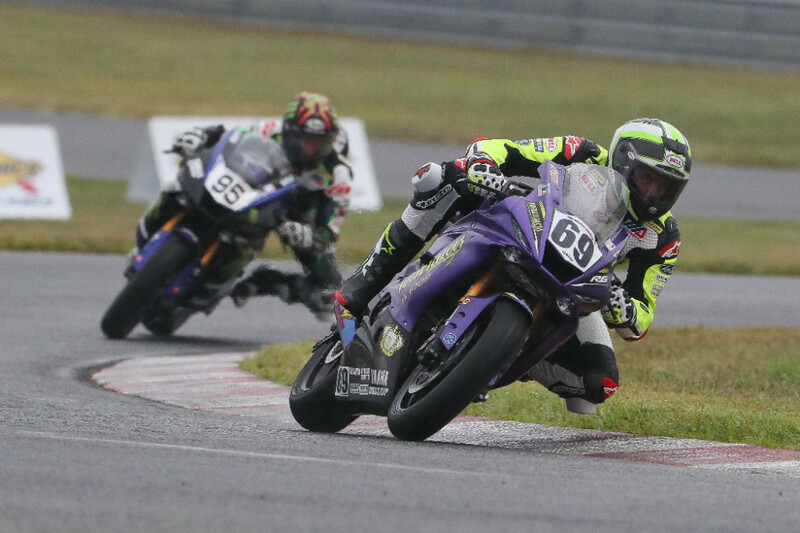 Rickdiculous Racing’s Hayden Gillim notched the win on a wet NJMP track for his second victory of the season, and Quicksilver/Hudson Motorcycles’ Richie Escalante completed the Yamaha podium sweep. Gillim was happy with the victory, his second of the year and first since Road Atlanta in April. The wet conditions played a huge factor in Saturday’s Liqui Moly Junior Cup race as the championship leaders all crashed out unhurt, including points leader Alex Dumas. The attrition started early and often as polesitter Ashton Yates also crashed his Yates Racing Kawasaki on the opening lap. KTM Orange Brigade/JP43 Training rider Dumas was in the catbird seat and in the lead group, poised to wrap up the championship based on merely finishing the race. However, the French Canadian went down in the wet and postponed his title celebration for at least another day. 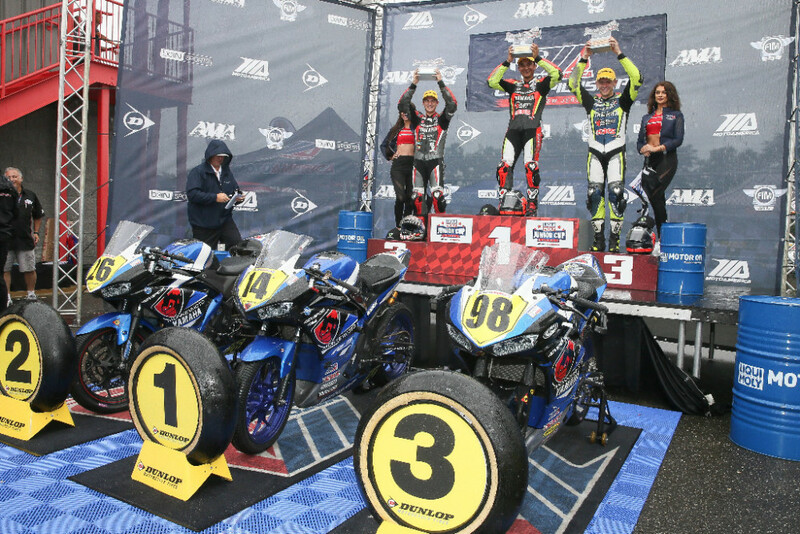 Meanwhile, the MonkeyMoto/AGVSPORT racing team swept the podium aboard their Yamaha R3s, with Kevin Olmedo taking the win, Marc Edwards finishing second, and Jay Newton coming home third. 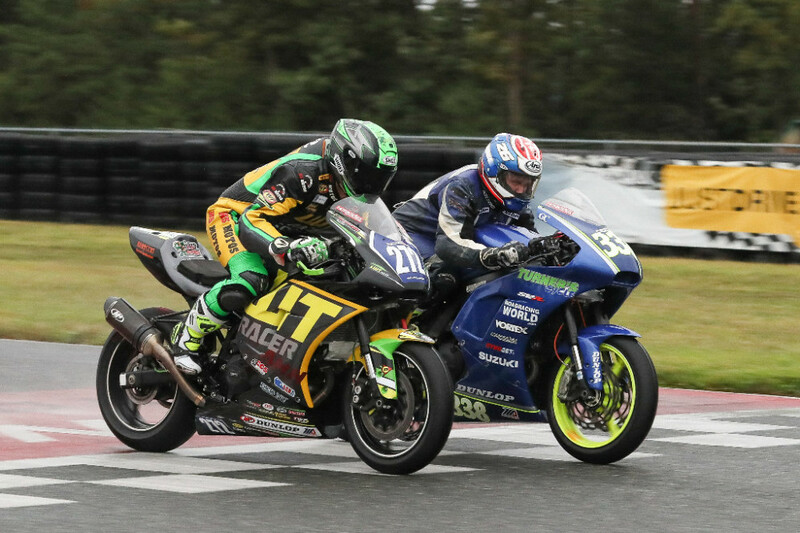 In what was arguably the best race of the day, Saturday’s Twins Cup feature event concluded in a photo finish with Turner’s Cycle Racing’s Kris Turner edging out LWT Racing’s Brian McGlade for the win by .003 of a second, with both riders aboard Suzukis. Syndicate/AP MotoArts’ Jason Madama, who crashed early on in the 14-lap event, remounted his Yamaha and raced all the way back up to third. Championship leader Chris Parrish also crashed his Ghetto Customs Suzuki and remounted, but he only managed to finish seventh. As a result, Parrish now leads the point standings by just two points with one race left on the schedule to decide it all. Saturday video highlights are available HERE. Saturday photos are available HERE.